Portrait Freedom is an organization that creates scroll sawn portraits of U.S. military personnel who lost their lives in the Afghan/Iraqi conflict. The portraits are offered as a reassurance to bereaved families that their loved ones are not forgotten. When a U.S. military service person dies on active duty, Portrait Freedom contacts his or her family to offer a portrait and request photos. The scroll sawyer makes a pattern from the snapshots and recreates the image in 1/8″ plywood using a scroll saw. The artist sands, finishes, and sometimes frames each portrait before either hand-delivering or mailing it to the family. For more information, visit www.ourheroesproject.org. 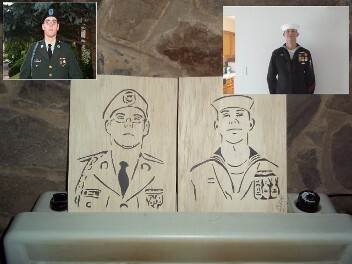 A pyrographer and painter, Alex Yawor has made it a personal project to make oil paintings of fallen military personnel. He gives the framed 16″ by 20″ portraits to the parents or spouse of the deceased at no charge. 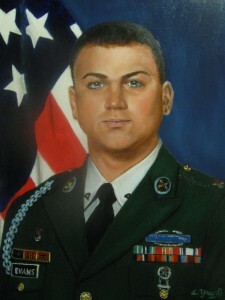 Alex explained, “I read about a woman painting portraits of our fallen heroes and giving them to the parents or wife. I felt that was the reason she was put on earth, and because I was given the ability to paint portraits, then that is why I am here.” He has painted more than 50 men and women over the last three years. Contact Alex Yawor at ayawor142@comcast.net.